Even if I didn’t know who Michael Patrick Hicks was, and I do, I can pick a Kealan Patrick Burke cover out of a lineup. I’d had Broken Shells on my TBR ever since Hicks revealed the cover, and when I saw it come across NetGalley, I pounced immediately. Being my first crack at a horror novel by Hicks, I wasn’t quite sure what to expect. The synopsis reeled me in (much like the promise of $5k to Antoine) and I was pleasantly surprised, and horrified, by what I read. Hicks does a fine job of emotionally grasping the reader with his character creation. You will reel for Antoine as he continuously fails to catch a break, and you’ll almost see things from Dangle’s perverse POV as he attempts to save mankind. Hicks also takes the opportunity to pick at some of the social issues that effect our current state as a nation and, IMO, does a fine job tying everything in. You’ll come for the story of survival, and stay for the darkness and gore. If you enjoy extremely gruesome creature horror and pitch black underground tunnels, then Broken Shells is right up your alley. Thanks to Broken Shells, I’ll definitely be checking out Mass Hysteria when I get some time off my ARC pile. 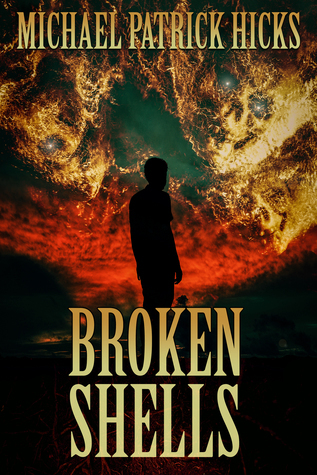 Broken Shells comes out February 6th so go pre-order now!